Blog | Outdoor Designs Got weeds? Let's Kill 'em! Got weeds? Let’s Kill ’em! So we’re certainly into cooler weather, and thank goodness the grass has slowed down growing. That being said – not everything has stopped growing. Once the soil temps dropped below 70, the weeds of summer slowly began to die. The frost finished them off. The beautiful thing about nature – as the summer weeds died, the winter weeds germinated. Winter weeds love, even thrive in the cold. They’ve adapted over the years to thrive in even the coldest of winters. So as we continue to get adequate rainfall and plenty of sunshine, the weeds are ready to go… GROW! You Mean, I’ve Still Got Weeds…? So what do we do about killing the weeds? Pick a decently warm day, preferably above 50 degrees. This will make sure the plants are breathing and photosynthesizing. And go ahead and plan to make your application of broadleaf weed control to kill weeds. Conrolling weeds should be simple with an herbicide, but which one do you pick? 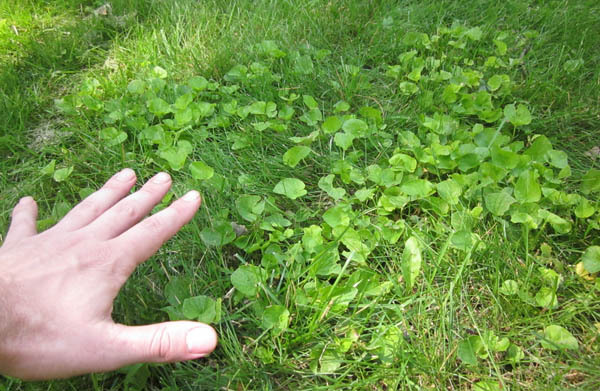 Knowing which weeds you have in the lawn is the most important part of killing weeds. Without it, how could you choose the right product? How would you know you’re treating it at the right time of year? How do you make sure you’re using the right rate to kill it and not make it stronger? Let google be your friend. Still can’t find it? Ask me! Step 2. Choose the right product. If you have a little henbit and chickweed, a simple 3-way phenoxy herbicide will suffice. These materials contain a plant hormone that force the plant to grow into its death. They usually take ~2-4 weeks to give a thorough kill in the cold. If you have a lawn full of wild violets, now is the time to use a more specific product. I like to use one that contains triclopyr & pyraflufen. The pyraflufen will provide a very quick burn down of the weed. The triclopyr will offer long term, systemic control of the weed – thus giving quick and lasting results. It’s important to make sure the product you use will actually kill weeds – not allow them to build a defense. Step 3. Read The LABEL! For applicators and homeowners, there are laws that govern herbicide applications. The labels attached these products are not suggestions, they’re the law. If we’re to preserve our environment, we are to follow the laws stated in the label to the best of our ability – even when it’s to kill weeds. Step 4. Make an accurate application. Spraying weeds can be as difficult as you want it to be. To guarantee results, an accurate application must be made. That means having the proper equipment. Even though you may have a 100$ backpack sprayer, pumping it too many times or choosing the wrong nozzle can cause a burst effect that leaves a dead spot in the lawn… 🙁 When in doubt, don’t hestiate to call me. I love to kill weeds! How do you plan on tackling your winter weeds? Comment on social media and let me know!